Begawan Foundation’s Bali Starling Conservation Project helps to sustain populations of the critically endangered species. 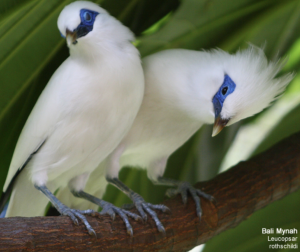 Begawan Foundation and the Bali Starling Conservation Project has received a Species360 membership grant to support its work with critically endangered #BaliStarlings at the Bali Starling Conservation Project in Indonesia. The species conservation project is among the first to successfully raise captive-bred bali starlings for release into the wild, and uses Species360’s member-supported ZIMS for Husbandry to track critical information regarding individual birds, their origins and traits. Also known as the Bali Myna, Jalak Bali and Leucopsar rothschildi, the first captive-bred Bali Starlings were released by the Bali Starling Conservation Project in July 2006. Within two weeks of their release, several birds had paired up and were observed bringing nesting materials to a variety of local trees, ficus, sugar palms and coconuts. Their first eggs had hatched by September 10th, and on September 28th, three birds instead of two were observed on the nesting tree. The first Bali Starlings to be released into the wild had started a family!